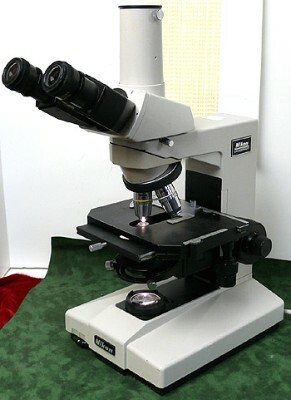 The Nikon Labophot Trinocular Microscope has been a Lab staple for years. Rugged and Reliable, they offer excellent image quality. Equipped with a Nikon model F Trinocular Head, and with 2 Nikon objectives- a 10X and a 100X- on the 5-position nosepiece, this is ready for bio work. This came out of a local controlled enviroment bio lab, where it was serviced anually, so is in excellent optical condition and very good to excellent cosmetic condition. The Nikon eyepieces are 10X widefield models. Ready to go to work in your lab.